White Hart – Norfolk Tales, Myths & More! There were some beautiful hot summer days in 1786. The squire of Taverham, Miles Branthwayt, had recently taken over the running of the Taverham Paper Mill with a former tenant, John Anstead, as his manager. Anstead had two grown-up sons, John junior and Thomas, and a beautiful daughter, Elizabeth, aged 21. In truth we cannot be sure that she was beautiful, but she was always very dear to her mother, and she had recently become very close to a young man called John Burgess. By harvest time that year she was expecting his baby! Elizabeth’s father was not best pleased with this news and refused consent to a marriage between the two. The child, Richard, was born early the following year in February and when it became apparent that the infant was healthy and likely to survive, Anstead agreed to a church wedding for the two and Elizabeth became Mrs Burgess; that was in March 1787. Elizabeth’s father, had given his blessing but he still needed convincing that John Burgess would prove a ‘worthy’ catch. It may seem hard-hearted to us but, as Elizabeth’s father saw things when he first turned down John Burgess – if his daughter were forced to marry an unsuitable lad merely to legitimate an unborn child, who later died or indeed if the father turned out to be a professional failure, Elizabeth would have missed her chance to make a better match – and all for nothing! Of course, had John Anstead known just how successful young John Burgess was to become, he would not have objected to his daughter’s choice in the first place. Maybe with all this in mind, and not having the ability to see into the future, Anstead gave John Burgess a position at Taverham Mill, at least to give him a start in furthering his prospects. At the same time, John and Elizabeth Burgess, who now had been made ‘honest’, christened their former ‘out of wedlock’ baby Richard. Thereafter they went on to have three further children. Charles who was a healthy boy like his elder brother; he was to survive and follow his father into milling at Bungay. However, George the next son died in infancy- which was not uncommon. Indeed, infant mortality was high in those days, and old John Anstead’s cautious delay in giving his consent to his daughter’s marriage had made sense from his point of view. Then a third son was born to Elizabeth and John, who was again christened George. The boy flourished and was followed in 1795 by a daughter, Sophia Ann. She also survived birth but sadly her mother did not. Elizabeth Burgess, nee Anstead, died; never to share the baby, her children, nor her John’s future success. She was buried in St Edmund’s Church churchyard in Taverham on the 7th of March 1795; she aged 30. That cold spring day marked the end of a love affair that had begun in that hot summer, nine years earlier – John would never forget her. After this sad episode in John Burgess’s marriage and an inauspicious start to his career, he finally settle down to his being a one parent family and building a future at Taverham Mill. Such was his clear determination that his paper making skills went from strength to strength within a very short time. His father-in-law, John Anstead, died early in the next century aged 77 years, followed by the Mill’s Squire co-owner, Miles Branthwayt who died at a comparatively young of 52. As a consequence, the Mill was next leased by a partnership led by the ambitious editor of the Norwich Mercury, Richard Mackenzie Bacon, under whom it was among the first in the world to install one of the new paper making machines. Burgess quickly became expert in operating this new equipment. After Bacon and his partner were made bankrupt in 1816, Burgess continued to operate the mill on behalf of the creditors, and when the business was acquired by Robert Hawkes, a wealthy Norwich merchant, Burgess became his partner – which constituted another step upwards. By 1820 he was wealthy enough to start buying property in Norwich and Costessey, where he bought several cottages and the White Hart pub. This he rebuilt ten years later. The White Hart Public House, Costessey. Photo: Public Domain. At the time there was probably no one alive who knew more about making paper by machine than John Burgess, and during these years Taverham Mill supplied paper to printers across East Anglia and as far away as Cambridge, where the University Press was a demanding customer. This prosperous period was dented 1830 when the Mill was attacked one Saturday afternoon in December by machine-breakers who caused hundreds of pounds’ worth of damage. One rioter was identified as having been present at Taverham on that afternoon, and was brought to trial, but was acquitted by a sympathetic jury. This turn of events seems to have discouraged Robert Hawkes. Although his company was compensated for the damage, he decided to sell his share in the business and retire. The new partners with whom Burgess now found himself saddled were two young men from wealthy local families. Unlike Robert Hawkes, they had no other business interests, and no doubt they tried to meddle at the mill, where Burgess had previously been free to manage alone. Whatever the reason, in the summer of 1833 he left the partnership, and took the vacant lease of the paper mill in Bungay. Bungay Paper Mill. Photo: Public Domain. With his sons he moved to Bungay and reopened the paper mill there. He was already 71 years old, and the work was probably mainly in the hands of his son Charles. Having been pioneers in the technique of modern machine-made paper they had taken a step back into the past to hand-made paper. This was certainly a come-down in professional terms, since the Bungay mill was engaged in making brown wrapping paper by hand, instead of the machine-made white printing paper that he was experienced in. But, on the credit side, he was at last his own boss and, maybe, he was in a better state of mind to enjoy the memories he once shared with his former wife, Elizabeth. The principal user of paper in Bungay, when John Burgess took over Bungay Mill, was a John Childs, a printer whose business would become Richard Clay which is still in existence today as part of the St Ives Group. In the 1830’s, Child was the owner of a large business, employing over 100 people and he specialised in large editions of substantial books such as annotated Bibles. These were not restricted to the printers at Oxford, Cambridge and London as the standard, non-annotated Authorised Version of the Bible was. These substantial works required a lot of paper, but his suppliers were not local. His account books showed that he was buying paper from Spicer’s in Cambridgeshire, and in 1834 from Dickinson, whose paper mill was at Apsley in Hertfordshire. Both Dickinson and Spicer were making paper by machine, and the mill at Sawston in Cambridgeshire was one of the first to use a Fourdrinier paper making machine in 1809. It was high quality and high volume paper, quite different from the ‘hand made’ paper being produced at Bungay by John Burgess. However there is evidence that the Burgesses, father and son, did supply paper to Childs. In 1833-36 there are entries for the buying of both brown paper and drab from Charles Burgess, and in 1836 and 1837 for brown paper from John Burgess. Brown paper would have been used merely for packing, but drab was used in the bookbinding process. Although there was also a printing industry in nearby Beccles, it is clear that the majority of Burgess’s custom would have been for wrapping paper, and it would not have been economic to transport it very far. This was not a particularly good position to be in, particularly when all Burgess’s success had been based on the modern paper-making process, and the Mill’s enterprise did not last for many years after John Burgess’s death on the 21 May 1838 – 52 years and 10 weeks after Elizabeth! 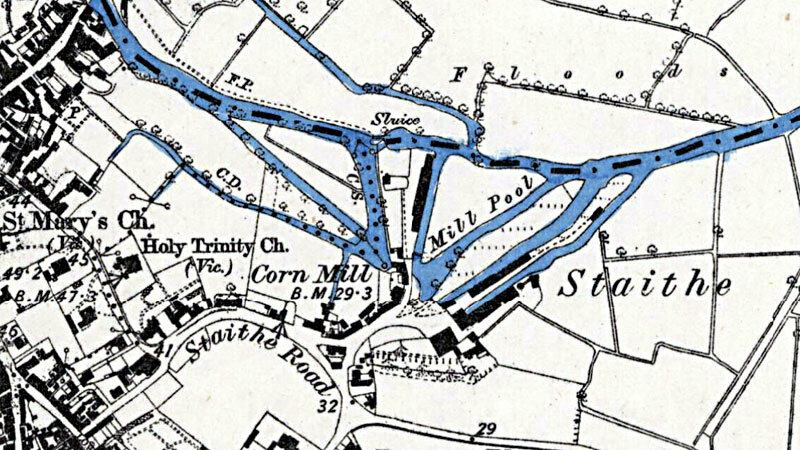 Bungay Paper Mill passed out of the Burgess family’s hands sometime in the 1840s after John Burgess’s Will had been proved. In it he had listed his properties – the White Hart public house and a double cottage in Costessey, together with three more cottages in Norwich. Thereafter, his reference to his business is short and rather downbeat. He instructed his Executors to continue his business ‘until such at time as it shall be beneficial to discontinue it.’ The most affectionate mention is for his daughter, Sophia Ann, who was to take her pick of his furniture to the value of £24 (about £4,000 in today’s money), ‘in regard to her kindness & attention toward me’ – somewhat reminiscent of Elizabeth, Sophia’s mother and John’s long lost wife for whom he grieved until his end. That moment brought final closure to the ‘love affair that had begun in that hot summer of 1786.